Dr. Frank Carson had been dreaming tantalizing dreams of cooling, effervescent beverages. Over and over again in his dreams he had risen from his bed, and tripping lightly down to the surgery in his pajamas, mixed himself something long and cool and fizzy, without being able to bring the dream to a satisfactory termination. With a sudden start he awoke. The thirst was still upon him; the materials for quenching it, just down one flight of stairs. He would have smacked his lips at the prospect if they had been moist enough to smack; as it was, he pushed down the bedclothes, and throwing one leg out of bed-became firmly convinced that he was still dreaming. For the atmosphere was stifling and odorous, and the ceiling descended in an odd bulging curve to within a couple of feet of his head. Still half asleep, he raised his fist and prodded at it in astonishment--a feeling which gave way to one of stupefaction as the ceiling took another shape and swore distinctly. "I must be dreaming," mused the doctor; "even the ceiling seems alive." He prodded it again-regarding it closely this time. The ceiling at once rose to greater altitudes, and at the same moment an old face with bushy whiskers crawled under the edge of it, and asked him profanely what he meant by it. It also asked him whether he wanted something for himself, because, if so, he was going the right way to work. "Where am I?" demanded the bewildered doctor. "Mary! Mary!" He started up in bed, and brought his head in sudden violent contact with the ceiling. Then, before the indignant ceiling could carry out its threat of a moment before, he slipped out of bed and stood on a floor which was in its place one moment and somewhere else the next. In the smell of bilge-water, tar, and the foetid atmosphere generally his clouded brain awoke to the fact that he was on board ship, but resolutely declined to inform him how he got there. He looked down in disgust at the ragged clothes which he had on in lieu of the usual pajamas; and then, as events slowly pieced themselves together in his mind, remembered, as the last thing that he could remember, that he had warned his friend Harry Thomson, solicitor, that if he had any more to drink it would not be good for him. 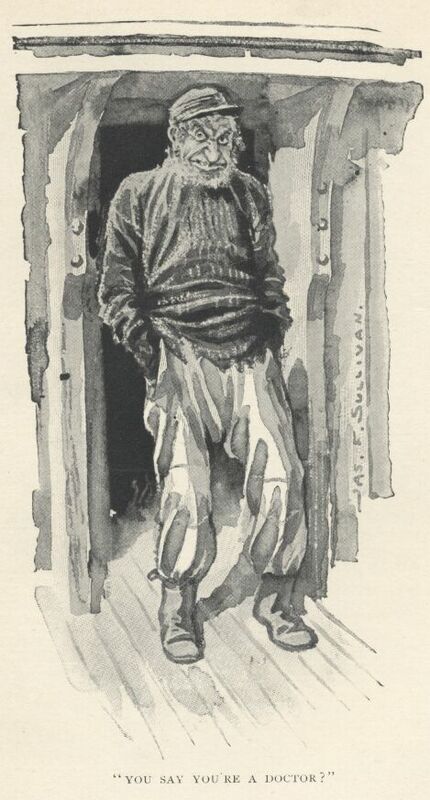 He wondered dimly as he stood whether Thomson was there too, and walking unsteadily round the forecastle, roused the sleepers, one by one, and asked them whether they were Harry Thomson, all answering with much fluency in the negative, until he came to one man who for some time made no answer at all. The doctor shook him first and then punched him. Then he shook him again and gave him little scientific slaps, until at length Harry Thomson, in a far-away voice, said that he was all right. "Well, I'm glad I'm not alone," said the doctor, selfishly. "Harry! Harry! Wake up!" "All ri'!" said the sleeper; "I'm all ri'!" The doctor shook him again, and then rolled him backward and forward in his bunk. Under this gentle treatment the solicitor's faculties were somewhat brightened, and, half opening his eyes, he punched viciously at the disturber of his peace, until threatening voices from the gloom promised to murder both of them. "Where are we?" demanded the doctor, of a deep voice from the other side of the forecastle which had been particularly threatening. "Barque Stella, o' course," was the reply. "Where'd you think you was?" The doctor gripped the edge of his friend's bunk and tried to think; then, a feeling of nausea overcoming all others, he clambered hurriedly up the forecastle ladder and lurched to the side of the vessel. He leaned there for some time without moving, a light breeze cooling his fevered brow, and a small schooner some little distance from them playing seesaw, as he closed his eyes to the heaving blue sea. Land was conspicuous by its absence, and with a groan he turned and looked about him--at the white scrubbed deck, the snowy canvas towering aloft on lazily creaking spars, and the steersman leaning against the wheel regarding the officer who stood near by. Dr. Carson, feeling a little better, walked sternly aft, the officer turning round and glancing in surprise at his rags as he approached. "I beg your pardon," began the doctor, in superior tones. "And what the devil do you want?" demanded the second officer; "who told you to come along here?" "I want to know what this means," said the doctor, fiercely. "How dare you kidnap us on your beastly bilge-tank?" "Man's mad," murmured the astonished second officer. "Insufferable outrage!" continued the doctor. "Take us back to Melbourne at once." "You get for'ard," said the other sharply; "get for'ard, and don't let me have any more of your lip." "I want to see the captain of this ship," cried the doctor; "go and fetch him at once." The second officer gazed at him, limp with astonishment, and then turned to the steersman, as though unable to believe his ears. The steersman pointed in front of him, and the other gave a cry of surprise and rage as he saw another tatterdemalion coming with uncertain steps toward him. "Carson," said the new arrival, feebly; and coming closer to his friend, clung to him miserably. "I'm just having it out with 'em, Thomson," said the doctor, energetically. "My friend here is a solicitor. Tell him what 'll happen if they don't take us back, Harry." "You seem to be unaware, my good fellow," said the solicitor, covering a large hole in the leg of his trousers with his hand, "of the very dangerous situation in which you have placed yourselves. We have no desire to be harsh with you--"
"Not at all," acquiesced the doctor, nodding at the second officer. "At the same time," continued Mr. Thomson--"at the--" He let go his friend's arm and staggered away; the doctor gazed after him sympathetically. "His digestion is not all it should be," he said to the second officer, confidentially. "If you don't get for'ard in two twos," said that gentleman, explosively, "I'll knock your heads off." The doctor gazed at him in haughty disdain, and taking the limp Thomson by the arm, led him slowly away. "How did we get here?" asked Mr. Harry Thomson, feebly. "How did we get these disgusting clothes on?" continued his friend. The doctor shook his head again. "The last thing I can remember, Harry," he said, slowly, "was imploring you not to drink any more." "I didn't hear you," said the solicitor, crustily; "your speech was very indistinct last night." "Seemed so to you, I dare say," said the other. Mr. Thomson shook his arm off, and clinging to the mainmast, leaned his cheek against it and closed his eyes. He opened them again at the sound of voices, and drew himself up as he saw the second officer coming along with a stern-visaged man of about fifty. "Are you the master of this vessel?" inquired the doctor, stepping to his friend's side. "What the blazes has that got to do with you?" demanded the skipper. "Look here, my lads; don't you play any of your little games on me, because they won't do. You're both of you as drunk as owls." "Defamation of character," said the solicitor, feebly, to his friend. "Allow me," said the doctor, with his best manner, "to inquire what all this means. I am Dr. Frank Carson, of Melbourne; this gentleman is my friend Mr. Thomson, of the same place, solicitor." "What?" roared the skipper, the veins in his forehead standing out. "Doctor! Solicitor! Why, you damned rascals, you shipped with me as cook and A. B." "There's some mistake," said the doctor. "I'm afraid I shall have to ask you to take us back. I hope you haven't come far." "Take those scarecrows away," cried the skipper, hoarsely; "take them away before I do them a mischief. I'll have the law of somebody for shipping two useless lubbers as seamen. Look to me like pickpockets." "You shall answer for this," said Carson, foaming; "we're professional men, and we're not going to be abused by a bargee." "Let him talk," said Mr. Thomson, hurriedly drawing his friend away from the irate skipper. "Let him talk." "I'll put you both in quod when we get to Hong-kong," said the skipper. "Meantime, no work, no food; d'ye hear? Start and cook the breakfast, Mr. Doctor; and you. Mr. Lawyer, turn to and ask the boy to teach you an A. B's duties." He walked back to the cabin; and the new cook was slowly pushed toward the galley by the second officer, the new A. B., under the same gentle guidance, being conducted back to the forecastle. Fortunately for the new seamen the weather continued fine, but the heat of the galley was declared by the new cook to be insupportable. From the other hands they learned that they had been shipped with several others by a resourceful boarding-house master. The other hands, being men of plain speech, also said that they were brought aboard in a state of beastly and enviable intoxication, and chaffed crudely when the doctor attributed their apparent state of intoxication to drugs. "You say you're a doctor?" said the oldest seaman. "I am," said Carson, fiercely. "Wot sort of a doctor are you, if you don't know when your licker's been played with, then?" asked the old man, as a grin passed slowly from mouth to mouth. "I suppose it is because I drink so seldom," said the doctor, loftily. "I hardly know the taste of liquor myself, while as for my friend Mr. Thomson, you might almost call him a teetotaler. "Next door to one," said the solicitor, who was sewing a patch on his trousers, as he looked up approvingly. "You might call 'im a sailor, if you liked," said another seaman, "but that wouldn't make him one. All I can say is I never 'ad enough time or money to get in the state you was both in when you come aboard." If the forecastle was incredulous, the cabin was worse. The officers at first took but little notice of them, but feeling their torn and tattered appearance was against them, they put on so many airs and graces to counteract this that flesh and blood could not endure it quietly. The cook would allude to his friend as Mr. Thomson, while the A. B. would persist in referring, with a most affected utterance, to Dr. Carson. "Cook!" bawled the skipper one day when they were about a week out. Dr. Carson, who was peeling potatoes, stepped slowly out of the galley and went toward him. "You say 'Sir,' when you're spoken to," said the skipper, fiercely. "My --- if you sneer at me, I'll knock your head off!" said the other, with a wicked look. "When you get back to Melbourne," said the doctor, quietly, "you'll hear more of this." "You're a couple of pickpockets aping the gentleman," said the skipper, and he turned to the mate. "Mr. Mackenzie, what do these two ragamuffins look like?" "Pickpockets," said the mate, dutifully. "It's a very handy thing," said the old man, jeeringly, "to have a doctor aboard. First time I've carried a surgeon." 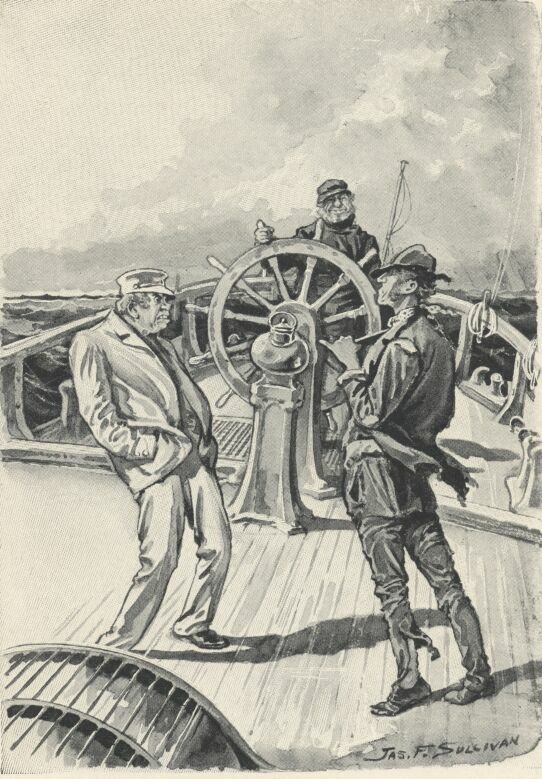 "And a solicitor," said the skipper, gazing darkly at the hapless Harry Thomson, who was cleaning brasswork. "Handy in case of disputes. He's a real sea lawyer. Cook!" "Sir?" said the doctor, quietly. "Go down and tidy my cabin, and see you do it well." The doctor went below without a word, and worked like a housemaid. When he came on deck again, his face wore a smile almost of happiness, and his hand caressed one trousers pocket as though it concealed a hidden weapon. For the following three or four days the two unfortunates were worked unceasingly. Mr. Thomson complained bitterly, but the cook wore a sphinx-like smile and tried to comfort him. "It won't be for long, Harry," he said, consolingly. The solicitor sniffed. "I could write tract after tract on temperance," he said, bitterly. "I wonder what our poor wives are thinking? I expect they have put us down as dead." "Crying their eyes out," said the doctor, wistfully; "but they'll dry them precious quick when we get back, and ask all sorts of questions. What are you going to say, Harry?" "The truth," said the solicitor, virtuously. "So am I," said his friend; "but mind, we must both tell the same tale, whatever it is. Halloa! what's the matter?" "It's the skipper," said the boy, who had just run up; "he wants to see you at once. He's dying." He caught hold of the doctor by the sleeve; but Carson, in his most professional manner, declined to be hurried. He went leisurely down the companion-ladder, and met with a careless glance the concerned faces of the mate and second officer. "Come to the skipper at once," said the mate. "Does he want to see me?" said the doctor, languidly, as he entered the cabin. The skipper was lying doubled up in his bunk, his face twisted with pain. "Doctor," he panted, "give me something quick. There's the medicine- chest." "Do you want some food, sir?" inquired the other, respectfully. "Food be damned!" said the sufferer. "I want physic. There's the medicine-chest." The doctor took it up and held it out to him. "I don't want the lot," moaned the skipper. "I want you to give me something for red-hot corkscrews in the inside." "I beg your pardon," said the doctor, humbly; "I'm only the cook." "If you--don't--prescribe for me at once," said the skipper, "I'll put you in irons." The doctor shook his head. "I shipped as cook," he said, slowly. "Give me something, for Heaven's sake!" said the skipper, humbly. "I'm dying." The doctor pondered. "If you dinna treat him at once, I'll break your skull," said the mate, persuasively. The doctor regarded him scornfully, and turned to the writhing skipper. "My fee is half a guinea a visit," he said, softly; "five shillings if you come to me." "I'll have half a guinea's worth," said the agonized skipper. The doctor took his wrist, and calmly drew the second officer's watch from its owner's pocket. Then he inspected the sick man's tongue, and shaking his head, selected a powder from the chest. "You mustn't mind its being nasty," he said. "Where's a spoon?" He looked round for one, but the skipper took the powder from his hand, and licked it from the paper as though it had been sherbet. "For mercy's sake don't say it's cholera," he gasped. "I won't say anything," said the doctor. "Where did you say the money was?" The skipper pointed to his trousers, and Mr. Mackenzie, his national spirit rising in hot rage, took out the agreed amount and handed it to the physician. "Am I in danger?" said the skipper. "There's always danger," said the doctor, in his best bedside manner. "Have you made your will?" The other, turning pale, shook his head. "Perhaps you'd like to see a solicitor?" said Carson, in winning tones. "I'm not bad enough for that," said the skipper, stoutly. "You must stay here and nurse the skipper, Mr. Mackenzie," said Carson, turning to the mate; "and be good enough not to make that snuffling noise; it's worrying to an invalid." "Snuffling noise?" repeated the horror-struck mate. "Yes; you've got an unpleasant habit of snuffling," said the doctor; "it sometimes. I worries me meant to speak to you about it before. You mustn't do it here. If you want to snuffle, go and snuffle on deck." The frenzied outburst of the mate was interrupted by the skipper. "Don't make that noise in my cabin, Mr. Mackenzie," he said, severely. Both mates withdrew in dudgeon, and Carson, after arranging the sufferer's bedclothes, quitted the cabin and sought his friend. Mr. Thomson was at first incredulous, but his eyes glistened brightly at the sight of the half-sovereign. "Better hide it," he said, apprehensively; "the skipper 'll have it back when he gets well; it's the only coin we've got." "He won't get well," said Dr. Carson, easily; "not till we get to Hong- kong, that is." "What's the matter with him?" whispered the solicitor. The doctor, evading his eye, pulled a long face and shook his head. "It may be the cooking," he said, slowly. "I'm not a good cook, I admit. It might be something got into the food from the medicine-chest. I shouldn't be at all surprised if the mates are taken bad too." And indeed at that very moment the boy came rushing to the galley again, bawling out that Mr. Mackenzie was lying flat on his stomach in his bunk, punching the air with his fists and rending it with his language. The second officer appeared on deck as he finished his tale, and glancing forward, called out loudly for the cook. "You're wanted, Frank," said the solicitor. "When he calls me doctor, I'll go," said the other, stiffly. "Cook!" bawled the second officer. "Cook! COOK!" He came running forward, his face red and angry, and his fist doubled. "Didn't you hear me calling you?" he demanded, fiercely. "I've been promoted," said Carson, sweetly. "I'm ship's surgeon now." "Come down below at once, or I'll take you there by the scruff of your neck," vociferated the other. "You're not big enough, little man," said the doctor, still smiling. "Well, well, lead the way, and we'll see what we can do." He followed the speechless second officer below, and found the boy's description of the first officer's state as moonlight unto sunlight, as water unto wine. Even the second officer was appalled at the spectacle, and ventured a protest. "Gie me something at once," yelled Mr. Mackenzie. "Do you wish me to undertake your case?" inquired the doctor, suavely. Mr. Mackenzie said that he did, in seven long, abusive, and wicked sentences. "My fee is half a guinea," said the doctor, softly, poor people who cannot afford more, mates and the like, I sometimes treat for less." "I'll die first," howled the mate; "you won't get any money out of me." "Very good," said the doctor, and rose to depart. "Bring him back, Rogers," yelled the mate; "don't let him go." But the second officer, with a strange awesome look in his eyes, was leaning back in his seat, tightly gripping the edge of the table in both hands. "Come, come," said the doctor, cheerily--"what's this? You mustn't be ill, Rogers. I want you to nurse these other two." The other rose slowly to his feet and eyed him with lack-lustre eyes. "Tell the third officer to take charge," he said, slowly; "and if he's to he nurse as well, he's got his hands full." The doctor sent the boy to apprise the third officer of his responsibilities, and then stood watching the extraordinary and snakelike convolutions of Mr. Mackenzie. "How much--did--ye say?" hissed the latter. "Poor people," repeated the doctor, with relish, "five shillings a visit; very poor people, half a crown." "I'll have half a crown's worth," moaned the miserable mate. "Mr. Mackenzie," said a faint voice from the skipper's cabin. "Sir?" yelled the mate, who was in torment. "Don't answer me like that, sir," said the skipper, sharply. "Will you please to remember that I'm ill, and can't bear that horrible noise you're making?" "Ill? Nonsense!" said the skipper, severely. "We can't both be ill. How about the ship?" There was no reply, but from another cabin the voice of Mr. Rogers was heard calling wildly for medical aid, and offering impossible sums in exchange for it. The doctor went from cabin to cabin, and, first collecting his fees, administered sundry potions to the sufferers; and then, in his capacity of cook, went forward and made an unsavory mess he called gruel, which he insisted upon their eating. Thanks to his skill, the invalids were freed from the more violent of their pains, but this freedom was followed by a weakness so alarming that they could hardly raise their heads from their pillows--a state of things which excited the intense envy of the third officer, who, owing to his responsibilities, might just as well have been without one. 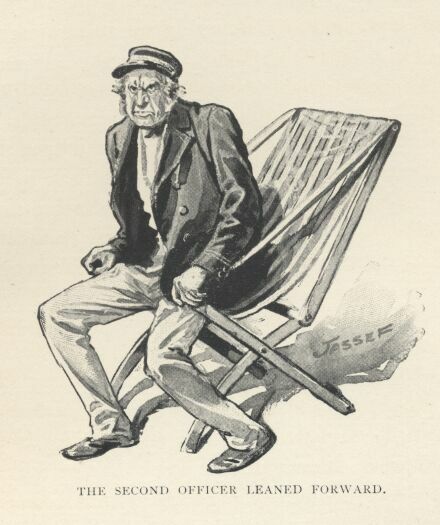 In this state of weakness, and with the fear of impending dissolution before his eyes, the skipper sent for Mr. Harry Thomson, and after some comparisons between lawyers and sharks, in which stress was laid upon certain redeeming features of the latter, paid a guinea and made his will. His example, save in the amount of the fee, was followed by the mate; but Mr. Rogers, being approached tentatively by the doctor in his friend's behalf, shook his head and thanked his stars he had nothing to leave. He had enjoyed his money, he said. They mended slowly as they approached Hong-kong, though a fit of temper on Mr. Mackenzie's part, during which he threw out ominous hints about having his money back, led to a regrettable relapse in his case. He was still in bed when they came to anchor in the harbour; but the skipper and his second officer were able to go above and exchange congratulations from adjoining deck-chairs. "You are sure it wasn't cholera?" asked the harbour-master's deputy, who had boarded them in his launch, after he had heard the story. "Very fortunate thing they had you on board," said the deputy--"very fortunate." "Seems so odd, the three of them being down with it," said the other; "looks as though it's infectious, doesn't it?" "I don't think so," said the doctor, accepting with alacrity an offer to go ashore in the launch and change into some decent clothes. "I think I know what it was." The captain of the Stella pricked up his ears, and the second officer leaned forward with parted lips. Carson, accompanied by the deputy and the solicitor, walked toward the launch. "What was it?" cried the skipper, anxiously. "I think that you ate something that disagreed with you," replied the doctor, grinning meaningly. "Good-by, captain." The master of the Stella made no reply, but rising feebly, tottered to the side, and shook his fist at the launch as it headed for the shore. Doctor Carson, who had had a pious upbringing, kissed his hand in return. Add An Adulteration Act to your own personal library.